Thank you for interest in translating using Weblate. Weblate can be used to translate many projects and every project can have different settings which influence whether you can translate or add suggestions only. Plase see Translation workflows for more information about translation workflow. Once you navigate to a translation, you will be shown set of links which lead to translation. These are results of various checks, like untranslated or strings needing review. Should no other checks fire, there will be still link to all translations. Alternatively you can use the search field to find a translation you need to fix. As an anonymous user, you have no other choice than making a suggestion. However, if you are logged in you can still decide to make only a suggestion instead of saving translation, for example in case you are unsure about the translation and you want somebody else to review it. On translate page, you are shown the source string and an edit area for translating. Should the translation be plural, multiple source strings and edit areas are shown, each described with label for plural form. There are various bits of extra information which can be shown on this page. Most of them are coming from the project source code (like context, comments or where the message is being used). When you configure secondary languages in your preferences, translation to these languages will be shown (see Secondary languages). Below the translation, suggestions from other users can be shown, which you can accept or delete. What are plurals? Generally spoken plurals are words which take into account numeric meanings. But as you may imagine each language has its own definition of plurals. English, for example, supports one plural. We have a singular definition, for example “car”, which means implicitly one car, and we have the plural definition, “cars” which could mean more than one car but also zero cars. Other languages like Czech or Arabic have more plurals and also the rules for plurals are different. Changed in version 2.18: The keyboard shortcuts have been changed in 2.18 to less likely collide with browser or system ones. There is small visual keyboard shown when translating. This can be useful for typing chars which are usually not present on the keyboard. 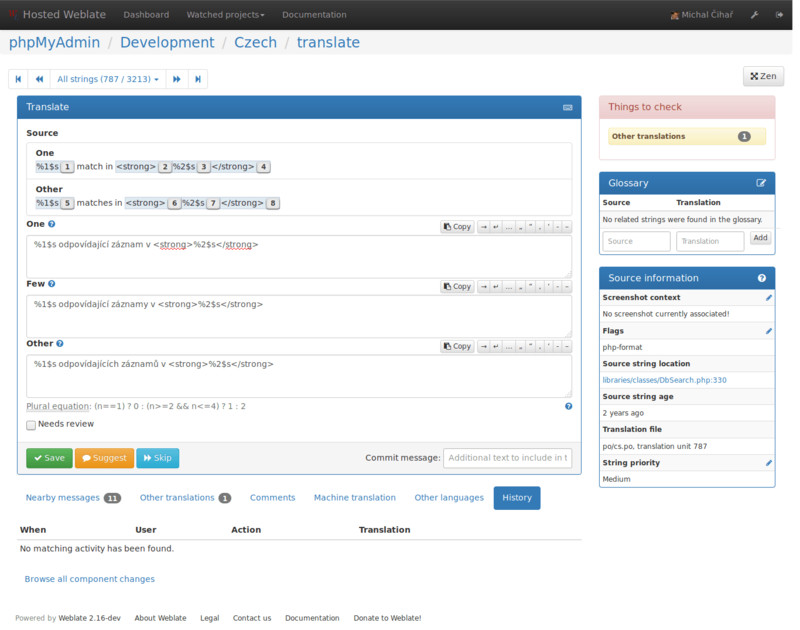 If the translation format supports it, you can also follow links to source code which contains translated strings. 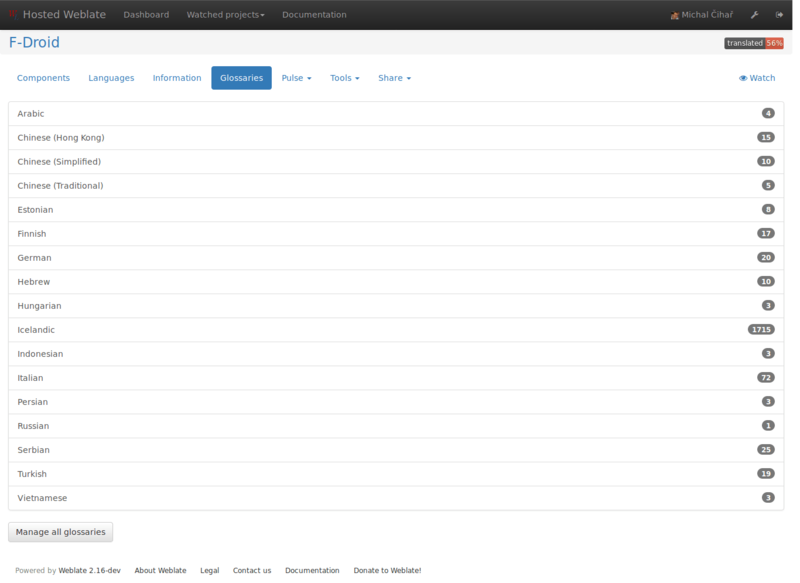 Every change is by default (unless disabled in component settings) saved in the database and can be reverted. Of course you can still also revert anything in the underlaying version control system. 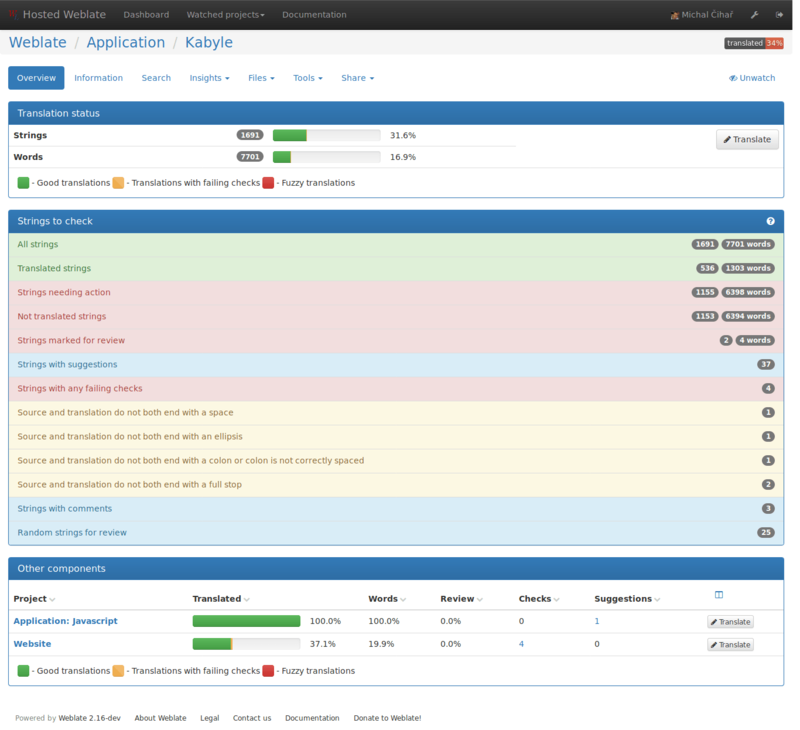 Each project can have an assigned glossary for any language. This could be used for storing terminology for a given project, so that translations are consistent. You can display terms from the currently translated string in the bottom tabs. On project page, on Glossaries tab, you can find a link Manage all glossaries, where you can start new glossaries or edit existing ones. Once a glossary is existing, it will also show up on this tab. 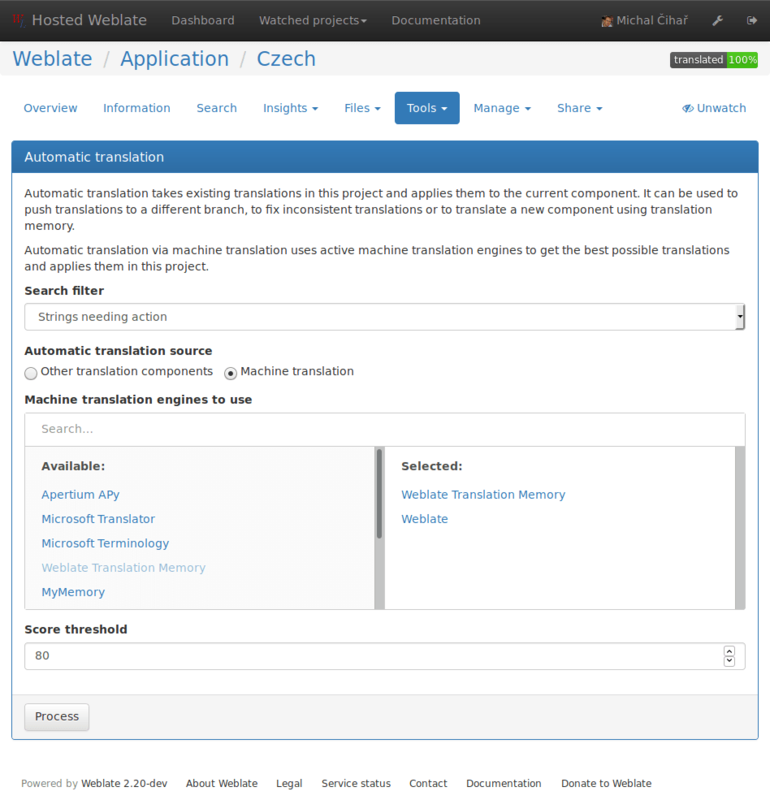 Based on configuration and your language, Weblate provides buttons for the following machine translation tools. Using other Weblate components as source for translations. Using selected machine translation services with translations about certain quality threshold. You can also choose which strings will be translated. Be careful that this will overwrite existing translations if you choose wide filters such as All strings. This feature can be useful in several situations like consolidating translation between different components (for example website and application) or when bootstrapping translation for new component using existing translations (translation memory). © Copyright 2012 - 2018 Michal Čihař. Revision 0ddd8b21.